British Jihadists are enemies of the State, traitors to the Crown, and a present danger to every man, woman and child in the country. Some 850 Britons are estimated to have left the UK to pledge their allegiance to the Islamic State, and there they crucified, raped and tortured untold thousands of Christians, Yazidis and ‘apostate’ Muslims across vast areas of Syria and Iraq, all in the name of Mohammed and for the greater glory of Allah. Well, almost unequivocal: that “in almost every case” leaves a little latitude. But it’s refreshing to hear a Minister of the Crown state so baldly that British Jihadists have “moved away from any kind of allegiance” to the British State (he says ‘government’, but he clearly means ‘Crown’ in the sense of democracy and British sovereignty), such that it would be preferable if they all died in Syria. So, more drone-bombs, more summary ‘executions’, and more internecine conflict between extremist factions are all preferable to allowing them to catch the first BA flight back to Manchester, to await the next Ariana Grande gig. 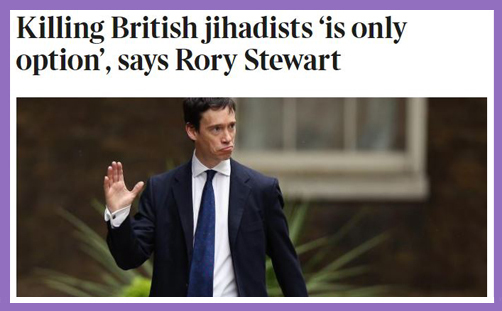 For Rory Stewart, British Jihadists ceased to be British the moment they pledged their allegiance to the Islamist doctrine of summary slaughter and religious supremacy, which involves killing themselves in order to kill us. And that “direct action” consisted of blowing him to kingdom come in lots of little pieces. If it is an act of lawful self-defence to kill those who plot against us from their terrorist lairs in Syria or Iraq, why may they not be put to death in the UK? If it is moral to kill them extra-judicially, how much more righteous would it be to permit the courts to sentence them to death? Our rulers, leaders and judges are appointed by God (Rom 13:3): ‘But if thou do that which is evil, be afraid; for he beareth not the sword in vain: for he is the minister of God, a revenger to execute wrath upon him that doeth evil‘ (v4). Brexit notwithstanding, may we set aside the European Union prohibition on the restoration of capital punishment (Charter of Fundamental Rights, Title 1, Article 2), because the Lisbon Treaty states that the death penalty is a lawful option “in the case of war, riots, upheaval”? Does the Jihadist threat not pose an immediate threat to our national security, precisely comparable to those of war, riot and upheaval? Is there a sense (undoubtedly lost) in which ‘Thou shalt not kill‘ must necessarily exclude those who would kill us when the nation is otherwise at peace with itself and with its neighbours? How can God protect and affirm life which is intent on destroying life? If life is a gift from God, it is not so sacrosanct as to become a god, idolised to the point of absolute inviolability. Is it not moral and righteous to sacrifice the aberrant life which would terminate ours? Yes, those cases are exceptional and ought rightly to be extremely rare, but if Rory Stewart – a Minister of the Crown – can envisage the justifiable extra-judicial deaths of British Jihadists in Syria and Iraq, where is the barbarism in the judicial process which, with the greatest reserve, ultimately bears the sword?